The National Association for the Advancement of Colored People and TV One held a town hall discussion and screening of the new documentary Two Sides on Saturday January 13 at the First AME Church. The documentary, executive produced and narrated by Academy Award winner Viola Davis, shines light on police brutality from both the perspective of the victim’s family and law enforcement. The first episode involved the death of Eric Garner. Garner died from an illegal chokehold from a police officer. Footage from the killing ignited the “I Can’t Breathe” movement across the nation. 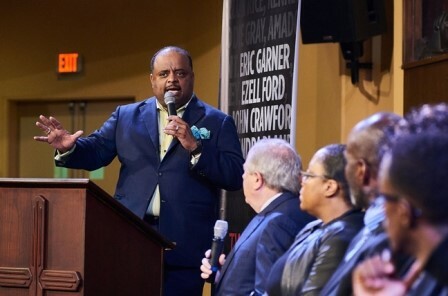 Roland Martin, journalist and television host, moderated the panel. The panel consisted of Two Sides producers, local law enforcement, victim’s family members and political leaders. Julius Tennon, who also executive produced with his wife Viola Davis, described the overall intention for the documentary. “We got involved with this projection simply because what is happening around our country,” said Tennon. 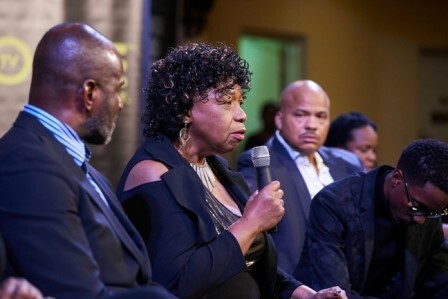 The most prominent panelist was Garner’s mother Gwen Carr. She spoke passionately about the social injustice involving her son. “Seems like all the officer has to say is I feared for my life. If the shoe were on the other foot, this wouldn’t happen. You don’t see any cases where a civilian harms a police officer getting off no matter what the situation is,” said Carr. Topics involving police accountability, body cameras, and unprosecuted law officials echoed throughout the dialogue. Retired Los Angles Police Department officer Charles Gaithier shared his views from a law enforcement perspective. “What I saw was inconsistent to what we were trained. We were taught to provide quality services not danger. It paints us all negative,” said Gaithier. The panel majority agreed police are not held accountable but attorney Larry Hanna offered a different standpoint. “I do see officers fired when they do something wrong especially in Los Angeles. I think the department does come forward publically when the officers do something wrong,” said Hanna. This sparked a response from panelist Melinda Abdullah who argued police are not held to a strict degree of accountability. Abdullah, professor and Chair of Pan-African Studies at California State University, shared the inconstancies of Hanna’s statement. “There have been three hundred murders in Los Angeles at the hands of police in the last five years, not a single officer has been charged in those cases. Let’s stop pretending there isn’t a problem,” said Abdullah. The four part docuseries airs Jan 22 on the TV One channel. For more information, visit the TV One website.